In Nunavut, the measure of a good artist was determined by the artist`s ability to accurately depict their subject matter. Proportion, scale, and overall form were regarded with great importance. If used correctly, they could render their carving incredibly lifelike – a great honour to the figure being represented. Once in awhile, an artist comes along who breaks all the rules. John Pangnark is one such artist. He rejected the traditional narrative and naturalistic style of carving in favour of a more simplified and geometric approach. He replaced curved lines with hard, cold edges. His faces, similar to fellow sculptor John Tiktak`s, were composed entirely of a few notches etched strategically into the stone. Geography played an important role in dictating Pangnark`s overall form. 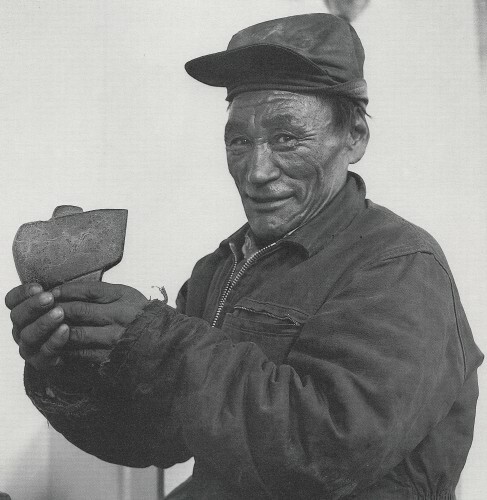 Similarly to John Tiktak and other carvers from Arviat (Lucy Tasseor Tutsweetok and George Arlook), they used what stone was readily available to them. Instead of using soft soapstone (found predominantly in Nunavik), basalt became the stone of choice. Basalt, a volcanic stone, is much tougher than soapstone which made it difficult to carve details. Instead of using this as a handicap, Arviat carvers found ways to work with the material`s hard quality and in doing so, accentuated its unique characteristics. Their motto is truly “Less is more”- a dream for any fan of Minimalism and Abstraction. John Pangnark was born at Windy Lake in 1920. He moved to Arviat in the late 1950`s. His decision to carve stone sculptures initially began as a way to avoid famine and provide for himself and his family. His works quickly became popular and were sold to the local co-op in the mid 1960`s. Pangnark achieved national and international recognition for his abstract art. In 1970, he was one of four Inuit artists invited to represent Canada at the EXPO 70 in Osaka, Japan. That same year, one of his carvings was featured with Jessie Oonark’s textiles in a two-person exhibition presented by the Canadian Museum of Civilization. His work is currently in the collections of the Dennos Museum Center and the National Gallery of Canada. Pangnark`s stone carvings shine with individuality and personal style. Described as “dynamic” and “enigmatic”, he has solidified himself as one of the 20th century modernists and the first Inuit artist who has made formal abstraction a primary part of his artistic identity. Pangnark died at Rankin Inlet in 1980.